Running Press Adult, 9780762449675, 216pp. Gluten-free doesn't mean goodbye, pasta! Gluten-free Pasta offers authentic pasta dishes from all over the world, sans gluten! When you cut out gluten, often you cut out your favorite pasta dishes, too, or find the store-bought gluten-free substitutes to be disappointing. But if it's pasta you're craving, there's a whole world of noodles just waiting to be twirled around your fork: homemade fresh pastas, Asian rice-based noodles, and quick GF boxed brands that will satisfy. You WILL eat pasta again! Robin Asbell's writing has appeared in Better Homes and Gardens, Real Food Magazine, VegNews, Clean Eating Magazine, and Vegetarian Times. She has written six previous cookbooks, including The New Whole Grains Cookbook and Big Vegan. Asbell lives in Minneapolis, Minnesota. 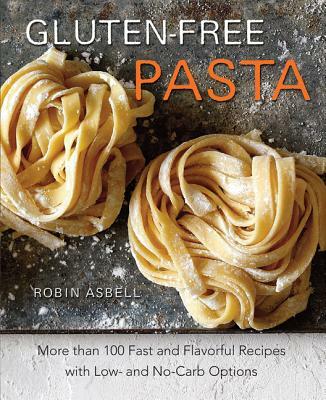 "Knowledgeably compiled by food writer and professional chef Robin Asbell, Gluten-Free Pasta: More than 100 Fast and Flavorful Recipes with Low- and No-Carb Options is a 216 page compendium showcasing more than one hundred palate pleasing, appetite satisfying recipes for gluten free dishes that would grace any dining occasion from modest family meals to elegant celebratory dining...Nicely illustrated with occasional full color photography of finished dishes, strongly recommended for personal, family, and community library cookbook collections."